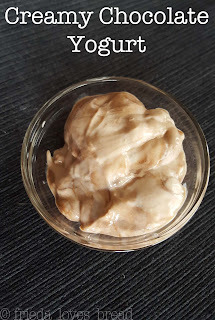 A light chocolate, mousse-like texture yogurt that is so simple to make. It only takes a few minutes of hands on time, but I love how my Instant Pot pressure cooker does all the work! You get to control the ingredients, tang, texture, and the sweetness of your yogurt. I don't like very tart yogurt - that mouth puckerin' feel is just not fun for me. I've been making plain Greek yogurt, straining it very thick and flavoring it with any of the following to make a chocolate yogurt: chocolate syrup, chocolate drink mix powder, or chocolate whey protein powder (my hubby's favorite). Lately, folks have been asking, "Why not make it with chocolate milk?" You can make yogurt with chocolate milk, but there are some things to consider. The added sugars in the milk compete with the other natural sugars (lactose) and slooooow down the culturing process. I wanted to be able to culture with LESS time for a mild flavor yogurt. Chocolate milk often has additives, emusilfiers, stabilizers (carageenan) to keep the chocolate from separating from the milk and thickening agents. Any and all of these ingredients can interfere with the culturing process, often resulting in lumpy, separated, or grainy yogurt. I used this recipe as a basis for my yogurt, using a different syrup, adding milk powder and using only 2 T. yogurt as my starter, incubating for 5 hours, chilled for 4 hours, strained over night with coffee filters. The result? A thin, very, very TART tasting yogurt that was NOT approved in my house. No amount of sugar could have been added to take out the tang! I got 1 cup of whey that I promptly tossed out. This time, I hesitantly used 1/4 cup Fage yogurt, chocolate syrup, semi sweet chocolate chips, instant milk powder, gelatin, incubated 5 hours with NO straining, and it was MUCH better! The yogurt was silky smooth, the whipped yogurt had a mousse like texture, and powdered sugar helped balance the tang factor. 1. Prep your Pot liner - Bring out your 1/4 cup of yogurt to get to room temp. 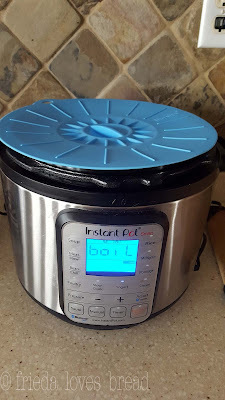 Put ice cubes in your clean Instant Pot liner. Let it sit for a couple of minutes, swish and empty the cubes/water. Do not dry with a towel. This will help your milk get to temp and keep your milk from scorching/cooking/sticking to the bottom of your pot. 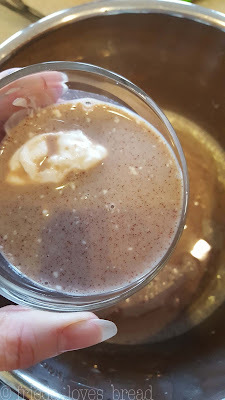 This is a tip that I use for my Instant Pot Egg Nog, which keeps the egg mixture from sticking. 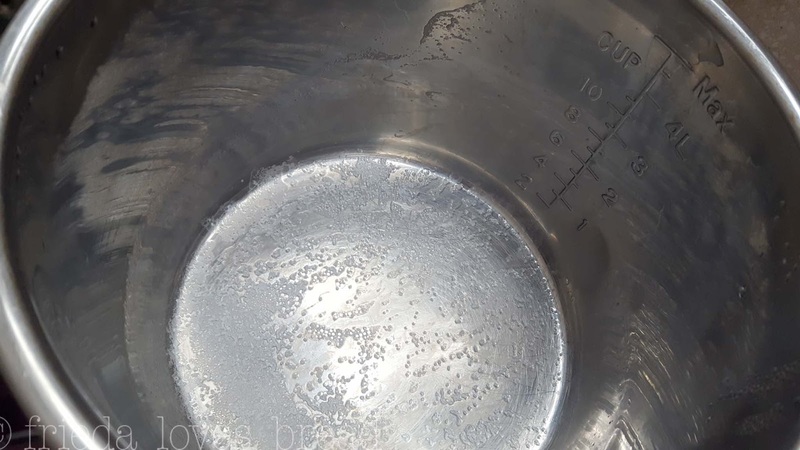 I emptied the pot to show you how very little milk is at the bottom of the pot. No worries about cooked on milk being scraped into the yogurt, affecting the texture! Also, it cleans very easily, as the milk is not stuck to the pot. 2. Prep your instant milk and heat your milk. Remove 1/2 cup of milk from the 4 cups of milk and set it aside. This is for your gelatin. Take out 1 cup of milk. 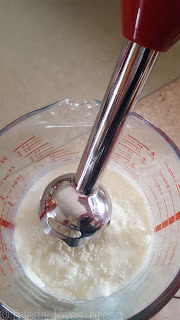 Add 1/3 cup instant milk powder and blend till smooth. Whisk in the powdered milk mixture into the remaining 3 1/2 cups of milk. 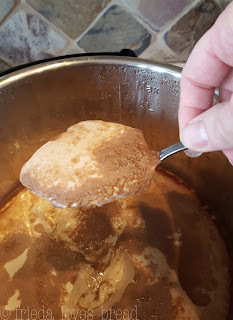 Pour the milk mixture into your Instant Pot liner. Press Yogurt, then quickly push Adjust. 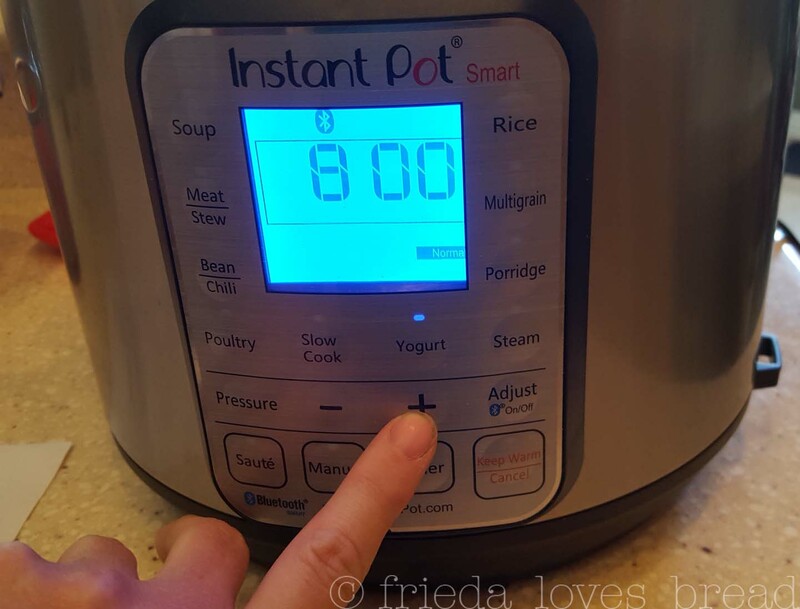 Display will say BOIL. You can use your IP lid, seal, vent closed, or any lid from your pots and pans. You can even use a glass pie plate lid. I used this silicone lid, which worked very well during the boil, incubation, and chilling in the fridge. 3. 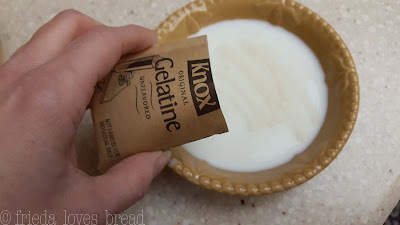 While your milk is heating, bloom the gelatin. 4. 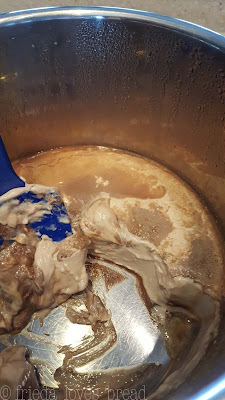 At the end of the BOIL cycle, your IP will beep. 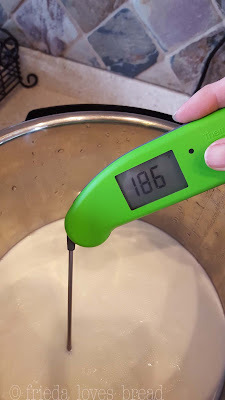 Take the temp of your milk. It should easily read 180°F or higher. Don't forget to remove any skin that may have formed on the top of your milk. Why does this happen? It is a result of the heat and milk proteins and is normal. Remove it, so your yogurt will be creamy and smooth. 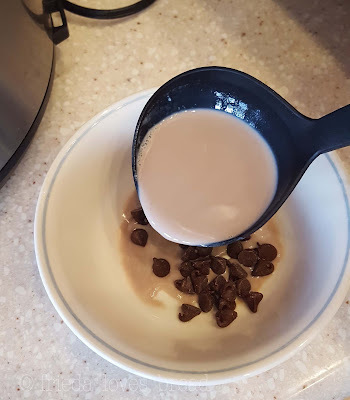 Use some of the hot milk to melt your chocolate chips, or grated chocolate. Wait a min or two, then whisk smooth. 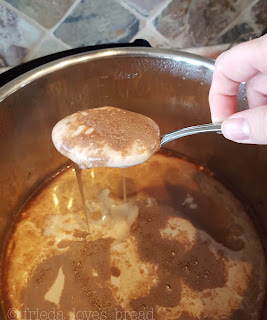 I used semi-sweet chips, but you can use milk chocolate, if you want. 6. Pour the chocolate syrup, chocolate milk mixture, and gelatin mixture into the hot milk. 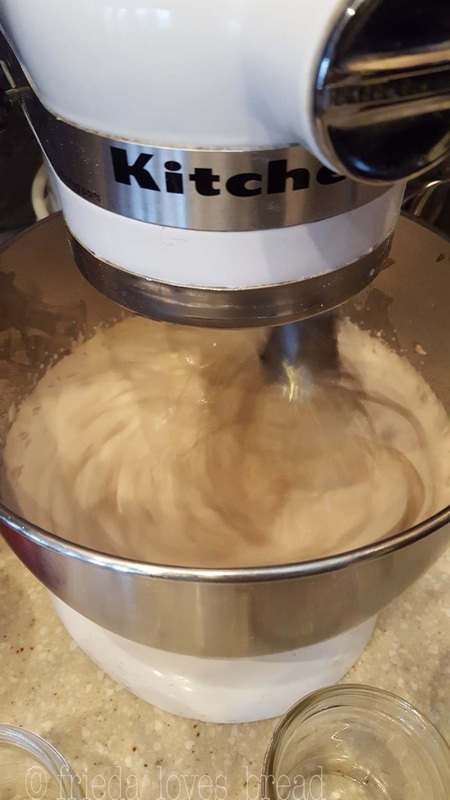 Whisk smooth. 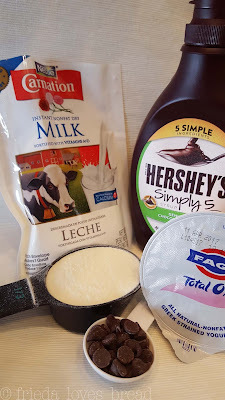 You can use any chocolate syrup that you want. I chose to use Hershey's Simply 5 for the ingredients: Cane sugar, organic invert cane syrup, water, cocoa, natural vanilla flavor. 7. 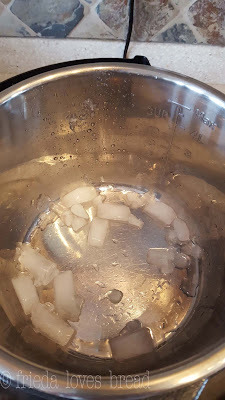 Cool the milk over an ice water bath, or sink with cool water, whisking, till it reaches 100° - 110°F range. You can let the milk sit out on it's own to cool at room temperature. 8. Add some cooled milk to your room temp starter. 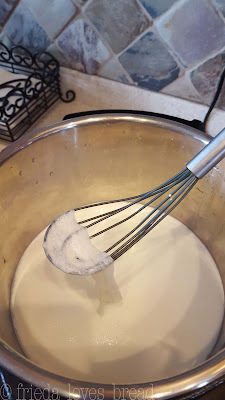 Whisk smooth, then whisk tempered starter into the pot of cooled milk. Since I don't want a TART yogurt, I will be checking it at the 4 - 5 hour marks. Here's what it looked like at 4 hours. Since there are no stabilizers in my milk, the chocolate has separated from the milk. It looks a little loose, so I will check it in another hour. It's looking much better at hour 5! 10. Take the pot of yogurt, cover and chill completely, at least 6 hours in the fridge or overnight. This will help the gelatin in the yogurt set. 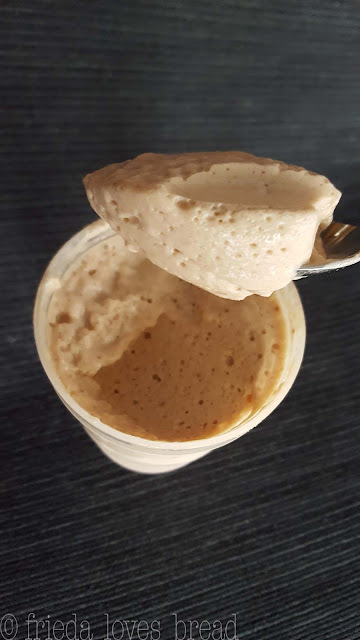 Even the whey will set, from the help of gelatin. So, there is no need to strain your yogurt! ...and whip it using my Kitchen Aid stand mixer and whisk attachment. 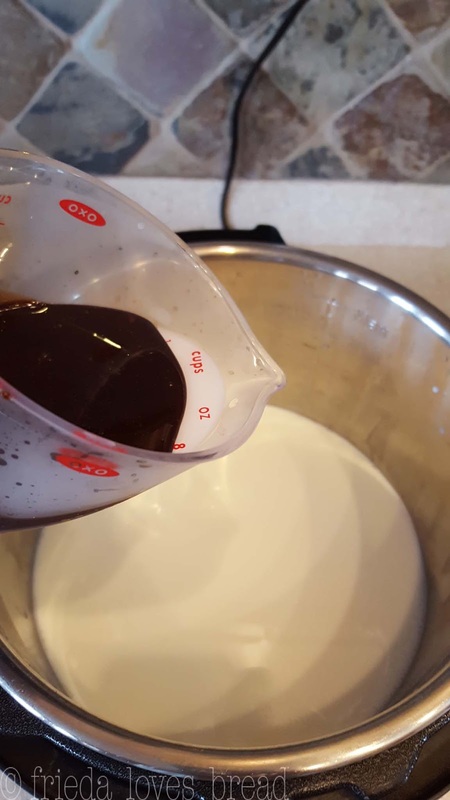 You will want to gradually start it, and then put it on the highest setting for 10 minutes, until the yogurt has approximately doubled in volume. While your yogurt is whipping, you may want to add some powdered sugar. 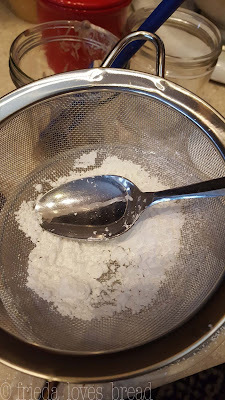 Push your powdered sugar through a sieve to take out any lumps and make it easier to dissolve. Whipping your yogurt and then setting it in the fridge to chill will 'set' your yogurt into a Yoplait Whips style yogurt! Your yogurt will look thin and bubbly, but will set into a light and airy treat. The result? A creamy mild chocolate yogurt with a mild tang and an airy whipped yogurt with a fantastic mouthfeel! Think of the possibilities for add ins: powdered peanut butter, raspberry puree/jam, chocolate chips, toasted coconut, instant coffee powder, mint, or even add cinnamon and a pinch of cayenne for a Mexican chocolate flavor!